Jan Skoyles writes: Back in the 1980s any activity in the Chinese economy would have failed to interest anyone in the Western world. Back then they were only a seventh of the size of the US and their economic policies would have barely registered. Since the 1980s China has seen an impressive transition from an emerging to an almost fully emerged economy. In just one generation’s time the Chinese economy will grow to $123 trillion – three times more than the entire world output of the year 2000. Robert Fogel predicts that by 2040 the Chinese economy will dwarf that of the US by growing to 3 times its size. On paper, China looks set to become the most powerful economic nation on earth. Since 1970 the income per capita has increased from under $500 to $7000. China has the largest growing middle-class society in the world, it is set to overtake the US in the near future. Levels of disposable income and spending are increasing as Chinese citizens strive to improve their standards of living. This is reflected in data which shows the PRC is now number one in the world for energy consumption, it now rivals the US in its demand for oil. This demand will only increase as the country strives to secure its oil supply by investing heavily in the new trans-Asia oil pipeline. Their increased demand for energy is being spent of various projects, particularly in R&D. In 2011 they filed the highest number of patents across the globe, beating both Japan and USA. Analysts say this is part of a quest for products to be known as ‘Designed in China’ rather than ‘Made in China’. Published patent applications have risen by 16.7% since 2006, by 2015 China is expected to have filed nearly 500,000 submissions. Their technical ability is already in high demand as last year China’s number one export to the USA became computer equipment. Whilst the US’s number one export to China was rubbish. This becomes more painful for the US when they, a deficit riddled country, realise that in 2010 for every $1 spent in China on American goods, the Americans spend $3.90 on Chinese goods in the USA. Barack Obama stated a few years back that he would not accept second place for America, but these figures suggest he might just have to, whilst the rest of us lag further behind. But, is this huge growth and progress sustainable? Are these figures even real? Despite the impressive figures quoted above, it is well documented that the Chinese economy is starting to experience a slowdown. But can it recover before it hits rock bottom? As Bill Bonner stated earlier this week, many views on the economic future of the country range from apocalyptic to the ‘unfailingly sunny’. Though Ben Simpendorfer, as Mr Bonner points out, offers an insightful and balanced view on how the future of the Chinese economy will pan out. For Mr Simpendorfer the country will have some struggles but he expects ‘…no hard landing in 2012.’ He believes that the Chinese government has, “the ability to continue borrowing, or further relax fiscal and monetary policy”. The government are embarking on an artificial stimulus which will see state-owned banks and SOEs build a 7 million housing units, per annum, over the next five years. The idea behind this is, quite clearly to keep people in employment. However the numbers do not justify an economic demand for so many new builds. Economies exist only to satisfy human wants and needs. They do not exist to produce numbers that look good in economic reports. China’s economy will have failed, just as other state-directed economies have failed, in its essential task of serving consumers. It becomes, then, an expensive fiction. China’s coffers, as rich as they appear, are also not inexhaustible. All of this means there is an inevitable quality to the collapse here, though the timing is hard to call. It seems that we should turn to the Chinese themselves as to what kind of a future the Chinese economy has to offer. It is common knowledge in the gold investment world that during times of financial crises we turn to safe-havens, such as gold. And the Chinese have not let us down. In 2001 when the Chinese government lifted its controls on the gold market, this promptly released a ‘pent up demand’ for the yellow metal. Gold demand for investment has increased by 14% a year since 2001, despite an increase in the gold price from $200 an ounce to $1600 an ounce. The Chinese have not forgotten lessons from past generations that gold is money. Last week the internet and newspapers have been abuzz with talk of the impressive levels of gold demand seen in China in the run up to the New Lunar Year. During Chinese New Year it is tradition for individuals to give one another gold as a way of wishing one another good fortune and luck. However, looking at the growing gold purchase figures since November, it seems as though the Chinese are not just doing their New Year’s shopping. In November 2011, the most recent month for which data is available, record levels of gold purchase activity was seen. Exports from Hong Kong to China in November, the measure used by analysts as a proxy Chinese gold demand, saw an increase of 20% since October and a nearly 600% increase from November the previous year. China had imported 102 tonnes of the precious metal, in November alone. This gold demand is driven by individuals rather than institutional investors. This differs from Western countries where gold buying is traditionally dominated by institutional investors. The Chinese respond to stresses in the market by investing in something which is free from counter-party risk and has repeatedly proven itself as a safe-haven. Like many of us in the West, the Chinese people are concerned about the rate of inflation. Gold, throughout history has been returned to in inflationary times. In China, this is estimated to currently stand at (officially) 4.1% – who knows where it stands unofficially considering they do not disclose how they measure inflation. The Chinese, like India, are known to be savers. However, as inflation rises more are being robbed of their savings. 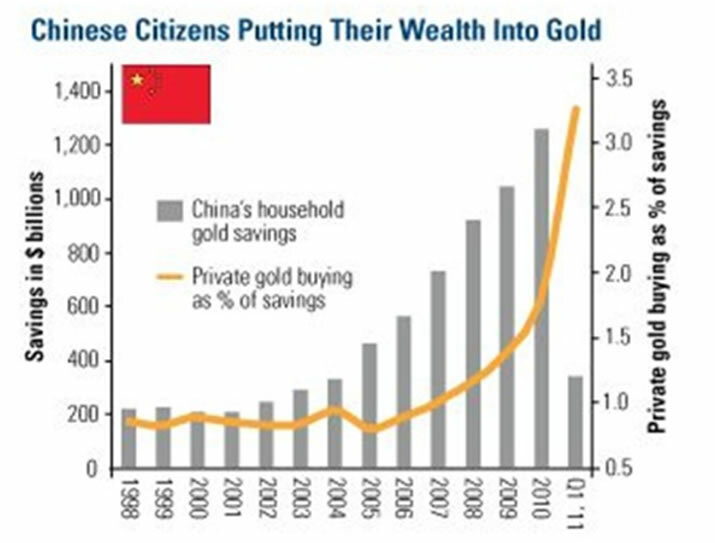 Gold shop owners in China estimate they have seen an increase of 20-30% in gold demand, most of which came from younger people. 47% of the individuals who reported they buy gold were from the lower-income bracket. This is interesting to note as many in the West believe gold is only a realistic prospect for individuals with plenty of spare cash. The size of the middle class in China is second only to the US and is growing rapidly. As it does so the amount of disposable income is also expected to increase. The graph below, provided by Julian Philipsclearly illustrates the increased levels of disposable income going into gold. The new middle classes do not appear deterred by the increasing gold price. In China the government have also been preparing themselves alongside the Chinese people, however in the future it might not be so easy to accommodate both parties. Estimates of 3,000 tonnes per annum demanded by Chinese individuals are rumoured. ‘The People’s Bank of China is buying all local production [making] it clear that there will not be enough gold available to accommodate this demand’Julian Philips. Whilst the Chinese economy may be about to head down a bumpy economic road it appears as though the people and the government know, at least inherently, how best to protect themselves. We cannot stand and point at them and their slowing down economy, when our own have almost stopped and gone into reverse. Whilst, in the West our governments and the majority of citizens run around making plans or sticking our heads in the sand, the Chinese are learning from the past. They are saving money, real money. This shows that the belief in gold as a safe-haven for wealth has not been tempered by the recent economic turmoil. Over the Chinese New Year it is tradition for individuals to give one another gold bars and souvenirs. The gift of gold is to wish good fortune and good luck. It may be the Year of the Dragon, but if there was ever a time when luck and fortune were needed most it is now. Jan Skoyles contributes to the The Real Asset Co research desk. Jan has recently graduated with a First in International Business and Economics. In her final year she developed a keen interest in Austrian economics, Libertarianism and particularly precious metals. The Real Asset Co. is a secure and efficient way to invest precious metals. Clients typically use our platform to build a long position and are using gold and silver bullion as a savings mechanism in the face on currency debasement and devaluations. The Real Asset Co. holds a distinctly Austrian world view and was launched to help savers and investors secure and protect their wealth and purchasing power.